T-Bird: Ok Jun, I’ve got some questions from the fans here! 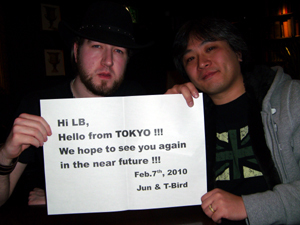 First off is from ibbod0; how did you meet Johnny and the rest of Crush 40? Jun: Wow, good question…actually, I was a huge fan of Hardline. Usually when I compose the songs and write the melody, I think about who would make a suitable singer for the song or a good singer for the melody or something like that. With the song “It Doesn’t Matter”, the original version for Sonic Adventure, it has a very high note-melody. When I was writing it I thought Tony Harnell would be the ideal singer, and in the end he performed on that song; this in now my way of composing. Talking about “Open Your Heart”, I had Johnny in mind, but I did not have any direct contact with him. Actually my friend who lives in Los Angeles knows Doug Aldrich [The guitarist for Whitesnake these days! – T] . For a short time Doug played in one of Johnny’s previous bands, Brunette, and I knew they still had a good relationship and that Johnny had appeared on Doug’s first solo release [on a track called “Face Down” on the album Alter Ego – T]. That meant maybe Doug could get in contact with Johnny, and so I asked my friend to get in contact with Doug, then Dough got in contact with Johnny…and that’s how I first got in touch with him. T-Bird: Ok, so SoA, Admin for the js.com forums asks, if say you had to replace Johnny, and of course that would be an impossible task, who would you ideally want as your dream replacement? T-Bird: Yes…if you had to. Jun: That would mean Crush 40 would be disbanded, seeing as Crush 40 is the teaming of Johnny and myself, in which case you would need to find a replacement for both of us! The lack of me or lack of Johnny would mean…yeah (laughs). T-Bird: Great answer – I honestly don’t think you could replace him either! Thirdly, Sonic1991 asks how did the collaboration with Emma Gelotte, Tinna Karlsdotter and the legend that is Marty Friedman [Legendary because he was the guitarist on my favourite Megadeth album! – T] come around for the track “With Me”? Jun: I wrote that song for the final boss in the Sonic and the Black Knight, and I so first I tried to find the female singers for that song. One of my friends in a Japanese record company takes care of dealings with All Ends [Tinna & Emma’s band – T], and so that’s how I got in touch with them. With Marty, although he was now living in Japan, I didn’t know him personally. I didn’t know his manager or any of the other business guys who dealt with him, so I asked him directly. Originally I planned to ask him to play all of the guitar stuff, but when he came into the studio, he said “hey, we should just keep these backing tracks!” We booked the studio here in Tokyo to record the lyrics and Marty’s guitar solo, but then the other guys came into the studio and wanted me to change the key, so I said “please give me one hour!” Since we use Pro-Tools, it was easy enough to raise the track one note, but it did not have very good clarity. We changed the key digitally anyway, then tracked the vocals, then Marty tracked his guitar. I went back later on and tracked all of the backing guitar in the correct key. Originally my idea was to have that song in a lower key, and in fact we [Crush 40] did the demo in that much lower key, and that was featured on the Sonic and the Black Knight “Face to Faith” album and it is much heavier. T-Bird: I think a lot of fans liked hearing a heavier version…and thanks for sharing the story! Short question: BlueLightning asks, what was your first guitar? Jun: He wants to know my first electric guitar? Actually, before I started playing electric guitars, I got an electric bass, since I was into Duran Duran at the time. Jun: Yeah! Originally I played the keyboard, but the drummers and the keyboard players were always at the back of the stage, and I always wanted to be one of the guys in front of the stage. I’m not good at singing, and I was not interested in singing, so I picked up the bass. However, after watching some MTV videos by the band called Ratt [Rock history lesson right here kids! – T] and Night Ranger, I got really into those bands, and so my very first guitar was a duplicate of the guitar the Ratt guitarist had…and I still have it. T-Bird: Do you remember what make it was? Jun: I think it was Fernandes, but these days I’ve replaced the neck with a performance neck…I will post a picture of it sometime! T-Bird: Haha! Definitely! So, Sinister Swiss asks after the remixing of the Angel Island Zone track for Super Smash Brothers: Brawl, have you considered going back and reworking any other classic songs from those classic titles? Jun: Interesting! It was very fun to do the remix for Angel Island, and also I made another arrangement of Sky Sanctuary from Sonic & Knuckles for the Mario and Sonic at the Olympic Winter Games, and if I get a chance I want to try to do more of those kind of remixes. T-Bird: HAHAHA! YEAH! Death Egg Zone from Sonic & Knuckles! I think that would make a lot of the fans would love that! I know we’ve covered this in the previous half of the interview, but Michelle Palmer asks if you are considering any tour dates? Jun: As I was saying, I am going to try and organise some Crush 40 dates around August time. [As a side note kiddos, Jun has a new band Bubbilicious Blvd. And is playing shows in Tokyo! Check out the TSS article on them! – T]. T-Bird: Ok, last question…Hawkz asks, what would you say has been the defining moment of your career? Jun: Hmmm…I’d have to say there are several. The first one is back in ’96, the moment I teamed up with Eric Martin. It was a very special moment for me. From that point I started trying to find direct connection with the artists, and that’s the way I’ve been doing it for years now. Both Sonic Adventure and Sonic Adventure 2 are very important games for me and very important titles for me, since Sonic Adventure was the very first time I was the sound director for a Sonic title, and I changed the sound of Sonic music drastically. With Sonic Adventure 2, some of us moved to the States, which changed our lives, and this time around we tried to make the music for the American market. It was very fun, and a very special time for not only me, but for the team too. Finally, with Super Smash Bros: Brawl We provided several pieces of Sonic music to be used in the game, and lots of new fans – by new fans I mean the players who did not have any experience playing Sonic games – listened to the music for the first time while playing the Smash Brothers game…to me that was a great experience. T-Bird: Lots of fond memories, and I’m sure a lot of fans hold some of those moments close to their heart too! Thanks loads for taking our questions Jun…hopefully we can talk to you again soon with more burning questions! Jun Senoue’s All-new band – Bubblicious Blvd.!!! Ok, ok, so I’m taking my sweet time to sort out the Senoue interview…I apologise I’m quite busy this week! So, to tide you over until then, here’s some nice juicy Senoue-related news, in the form of Jun’s brand new band, Bubblicious Blvd. They’re a Tokyo based band at the moment, and they’ve only played one gig back in January, but here’s hoping we see more from them! Jun descrbied them as his “fun” band, and you may actually already know some of the members of the band…in fact the singer is none other than CJ Szuter, the All-Hailer Shadower himself, from the band Magna-fi. If you’re lucky enough to be around the Meguro Ward of Tokyo next Sunday, the 21st (it had to be the day after I fly back to the UK, didn’t it? ), you can head down to the Live Station and watch Jun and Mike at work in the flesh!!! If you can’t, well, then you’ll have to make do with the videos on their Myspace for the time being – keep an eye on it for more material in the near future! If anyone figures out what Bubblicious means…let me know…in the mean time. If you can beat this with something else Bubblicious, let us know! Shortest competition ever: The Result! Yeah, I’m not good at the whole mystery game, but there you go. Anyway, earlier (or yesterday in my case) I caught up with legendary Sonic soundtrack composer, director and performer extrodinaire Jun Senoue in Shibuya, Tokyo. Needless to say I had a long chat with Jun about many things…things like the possibility of a second Crush 40 album…things about what he’s working on currently…and yes, even Sonic the Hedgehog 4 came up in conversation. So, keep an eye out on both Sonic Stadium and junsenoue.com for the interview on what’s going down over the next few days! As well as the questions I had lined up, I also got Jun to answer what I thought were the seven best fan questions going, and so I asked both TSS and js.com readers to submit! I also said I would hand out a prize to the best question propped, but I had so many, I’m having to give out two prizes – one for a member of each site! So first off, congratulations to both Michelle Palmer and Hawkz from TSS, who’s questions both made it into the final cut of the “Chaos Questions” as I’ve come to name them (there’s seven, see! ), but, the my favourite question proposed was from…. Congratulations! 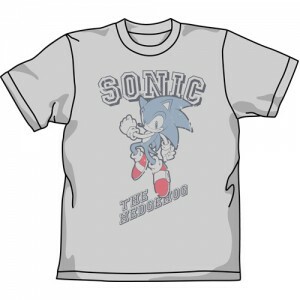 You are now the proud owner of a Exclusive Japan-only COSPA Sonic the Hedgehog T-Shirt! Please send me your name and address (and shirt size!) by either PM on SSMB or at tbird [at] sonicstadium.org. Also many congratulations to Ibbod0, Bluelightning, SoA and Sonic1991 (winner of the Sonic Heroes Triple Threat album!) 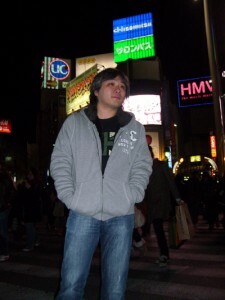 on the JunSenoue.com forums – your questions have also made the cut too! Thanks to everyone who sent in questions; there were many good ideas, and I hope in some way or another I will have asked a question you would like to know the answer too! Anyway, stay tuned for the full Jun Senoue Interview! Win a signed copy of Jun Senoue’s The Works on Project 24! Yup! Be sure to tune into the 24-hour radio livecast on SEGASonic:Radio on Sunday to have a chance of winning yourself a very snazzy CD! Continue reading Win a signed copy of Jun Senoue’s The Works on Project 24! 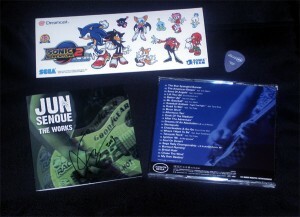 Crush 40Johnny Gioelijun senoueParfectProject 24Segasonic:radioSuper Sonic SongsT-TIMEThe WorksWin win win! 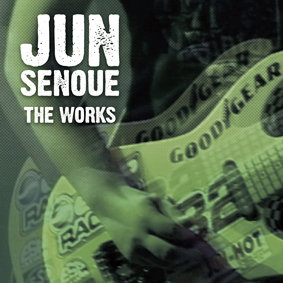 Personalised Copies of Jun Senoue’s “The Works” on Sale! Jun Senoue is a man who needs little introduction. He’s had his hands in the Sonic pie since way back when, working alongside others such as Howard Drossin on the Sonic the Hedgehog 3 soundtrack. 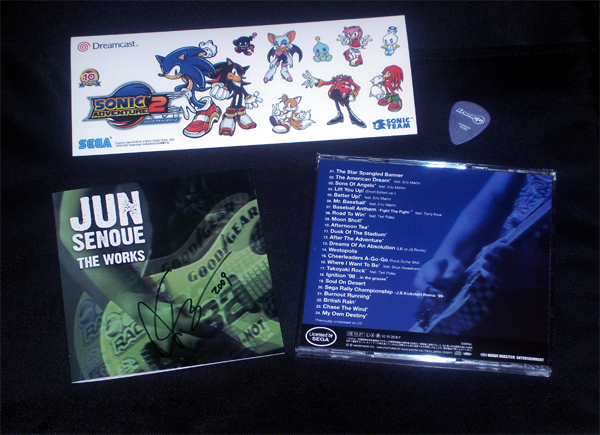 Mr Senoue really stepped into the spotlight with the launch of Sonic Adventure back in 1999, when Jun’s band Crush 40, fronted by Johnny Gioeli, blew most of the community away with its blistering soundtrack of fast-paced rock and epic power anthems. He’s just as awesome in real life too! Well as most of you know Jun has been busy then, and not just with Sonic stuff. “The Works“ is a selection of tracks from other games such as the NASCAR and Daytona USA racing titles, along with music from the only-released-in-Japan titles, Managing Baseball Team Game / Managing J-League Football Team Game. Those of you who are fans of Ted Poley and Eric Martin will be pleased to know they both feature heavily on the album providing more awesome-sauce vocals. Anyway, for a limited time Jun Senoue will be personally autographing copies of the soundtrack, which can be purchased on the official Jun Senoue fansite for the meagre price of $30 plus a small postage charge (works out at about £22 in total for UK peoples). Not bad eh? It also looks like Jun will be doing a similar thing with the Best of Crush 40 album “Super Sonic Songs” that will be released next month. The full track listings for both of the albums are listed on the website should you wish to examine them before purchase. If you’re feeling a little tight fisted, or you simply haven’t got enough pocket money to blow on a copy, then don’t fret! There will be a chance to win yourself a copy of the album over the SEGASonic:Radio Project 24 livecast on the 15th of November! Keep your eyes peeled for more info! Props to Martin aka SOA, webmaster of junsenoue.com, for helping sort out this amazing offer for us lucky, lucky fans!